On 10 September 1985 at Ninian Park in Wales, Rangers winger Davie Cooper stepped up to take the most important penalty kick of his life in the 81st minute of a World Cup qualifying encounter between Scotland and Wales. The Tartan Army's place at the finals in Mexico '86 depended almost entirely on Cooper striking the target, as the Scots were trailing the Welsh 1-0, thanks to an early Mark Hughes goal in the 13th minute, and only a draw or a win against their celtic cousins would guarantee Scotland one of the two qualifying places from Group VII. As the 80th minute approached, Scotland's Stephen Nicol had set up a telling cross which was nodded on by Graeme Sharp and found David Speedie in the box - the little striker then sent the ball forward, and Welsh defender David Phillips was adjudged to have handled in the penalty area. Referee Johannes Keizer of Holland didn't hesitate in pointing to the spot, and the entire Scottish nation watched with nervous anticipation as Cooper stepped up and converted with cool confidence. remonstrated with an intrusive photographer near the dugout, then collapsed on the track and died shortly afterwards on the physiotherapy table in the away dressing room.In those brief moments, probably the greatest light in Scottish football history was extinguished, and the game north of the border never truly recovered. The Wee Rovers would remain Stein's club for the next eight seasons, during which time he would feature in 236 appearances for the club and score nine goals, whilst still working as a miner in the Lanarkshire coal pits. He was married on 3 October 1946 to Jean Toner McAuley, and in 1950 he departed Cliftonhill and made a surprising trip across two borders to the non-league Welsh side, Llanelly Town. The transfer was acrimonious - not to mention illegal - and a series of protracted negotiations, combined with homesickness and deteriorating results for the club, saw Stein return home to Lanarkshire with the intention of giving up football entirely in favour of a life down the pits. Had it not been for the vision of the legendary Celtic scout, Jimmy Gribben, the Glasgow club may never have known the heights of success they would eventually reach under Stein, both as a player, and later as manager. For it was Gribben who passed Stein's name along to Celtic's chairman Robert Kelly, and an approach was quickly made to Llanelly Town, shortly before Stein made his fateful journey back home to Scotland. Celtic's fans were unconvinced when Big Jock signed for the club in December of 1951. Many considered him to be too old, and much was made of his background as a Rangers supporter. His father refused to speak to him over the matter, and many of his old acquaintances in Burnbank turned their backs on a man whom they had perceived to have 'turned coat' on them. Stein was unperturbed. Almost by accident, his career at Celtic soon expanded into the role of club captain when Sean Fallon broke his arm during the 1952-53 season. Fallon had already nominated 'Big Jock' as his vice-captain over the legendary Bertie Peacock, and the Irishman never regained the armband, but did go on to make his mark as Stein's right-hand man in their famous managerial partnership at the club in later years. In his role as the club's leader on the pitch, Stein captained Celtic to victory in the 1953 Coronation Cup, defeating the tournament favourites, Hibernian, in the final – but not before Aberdeen, Rangers, Arsenal, Manchester United, Newcastle and Tottenham Hotspur had all been eliminated from the competition. However, Stein's crowning glory in the Celtic colours as a player was the League Championship and Scottish Cup double the club earned during the season that followed. On 29 January 1957, aged 34, Stein retired as a player from Celtic Football Club, mainly due to a persistent ankle injury, having notched up 147 matches over six seasons. His final appearance for the club as a player was against Coleraine, during a close-season encounter. During this period, Stein developed his skills as a coach and was offered the job of staff coach to the Celtic youth squad, but the position held no ambition for the big man, and in 1960, he soon found himself with the paradoxical challenge of rescuing Dunfermline FC from relegation and establishing himself as manager of the Fife club. The resounding effect of Stein's move from Celtic to Dunfermline was confirmed when he guided the club to the final of Scottish Cup in 1961, defeating his former club 2-0 in a midweek replay, following a goalless draw at Hampden on Saturday 22 April. It was the first time in Dunfermline's history the club had won the trophy. Fairs Cup, and the Pars eliminated Everton 3-1 on aggregate, conceding only one goal at Goodison Park in the first leg. But it was the monumental performance in the next round that sent shockwaves around Europe, when Dunfermline clawed back a four-goal deficit from the first leg of their encounter with Spanish giants Valencia, and notched up an incredible 6-2 scoreline at East End Park to take the match to a play-off in Lisbon. Shortly after his spell at Dunfermline, Stein was appointed manager of Hibernian, where he won the Summer Cup and expanded his talents as a manager. However, his spell at the Edinburgh club was short-lived, and just one year later, in 1965, he was approached by a crisis-struck Celtic to return to the club as their manager. Success in Glasgow with Stein at the helm was almost instant, and for the next 13 years, Celtic's dominance of Scottish football became supreme. He started by guiding the team to the Scottish Cup and defeating his former club, Dunfermline; Celtic's first major win since 1958. He went on to win the club's first ever domestic treble and set a phenomenal Scottish football record of nine successive league championship titles in a row from 1966 to 1974. In 1966, Celtic also reached the semi-finals of the European Cup Winner's Cup, where they eliminated by Liverpool on away goals. On 25 May 1967, at the Estadio Nacional in Lisbon, Portugal, Celtic faced Inter Milan in the final of the European Cup and became the first British and northern European club to win the trophy, overcoming the Italian giants 2-1 to bring the famous trophy to back to British shores for the first time ever. It was the ultimate achievement in an ongoing success story generated by Stein's presence at the club. The early success of Celtic under Willie Maley was completely overshadowed by Stein's unstoppable progress and innovation. Before him, Celtic were not recognised outside of the UK, and barely noticed outside of Scotland. In the three decades before Stein took over, Celtic had won only three league titles, and had not picked up a single piece of silverware since 1958. As many observers have commented over the years, Jock Stein was Celtic; he made the club what they are today and his legacy remains as relevant in the modern era, as it did 40 years ago. When Stein departed the club in 1978, the circumstances were less than amicable. Celtic refused to reward his services at the club with a role on the board of directors, instead, they offered him offering him the opportunity to manage Cetic's pools outlet, but Stein gracefully declined and moved on to succeed Jimmy Armfield as manager at Leeds United FC, but remained in the job for only 45 days, before resigning to take up the position as head coach of the Scotland national team. Stein had previously taken on the role as part-time national manager of Scotland in 1965, whilst still in charge at Celtic, but under his stern leadership from 1978-1985, Scotland reached the World Cup Finals in Spain '82, suffering elimination only on goal difference to the Soviet Union. 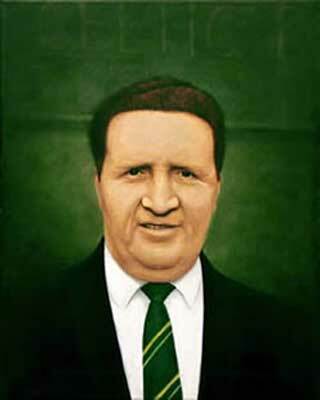 On 10 September 1985 in Cardiff, Jock Stein's life ended as it he had lived it – through football. His final decision as head coach of Scotland was to substitute Aberdeen's Gordon Strachan for Davie Cooper in that ill-fated World Cup qualifying encounter with Wales. Cooper took to the field and netted the penalty-kick that sent Scotland to the World Cup in Mexico '86, an achievement which Stein would never realise. His individual record as Scotland head coach is second only to Craig Brown's; 68 games played, 30 won, 13 drawn and 25 lost. However, the football vision of a Lanarkshire miner can never be truly explained by statistical analysis alone. Stein was more than a collection of phenomenal results. By most accounts he was also a gregarious character; chatty, friendly and intelligent – with presence, unique man-management skills and a fiery temper that could silence a dressing-room full of confident young stars in an instant. Exactly how he managed to transform a team of underachievers into a feared force in European football at the first attempt defies explanation, but Scottish football stepped into the light when Stein left his mark on the game, and many of today's top managers owe something of their achievements to Stein's tactical nous. 1922 – John Stein the only son of George and Jane Stein was born on October 5th at Burnbank, Hamilton, Lanarkshire. 1937 – Leaves Greenfield school in Hamilton and after a short time working in a carpet factory goes down the pits to become a miner. 1938 – Joins Blantyre Victoria junior football club. 1942 – Takes his first steps into senior football when he joins Albion Rovers. Makes a name for himself as a no nonsense Centre-Half and goes on to make over 200 appearances for the Coatbridge club, which also includes a brief loan spell to Dundee United in 1943. 1948 – Rovers win promotion to the First Division. Stein described in a book to mark the occasion as “the best capture the club ever made”. 1950 – Signs for non-league Welsh club Llanelly (Llanelli) Town. For the first time in his career Stein becomes a full-time professional footballer on the princely sum of £12 per week. 1951 – Stein is desperate to come home to Scotland as he had left his wife and young daughter behind and his house had been broken into twice in his absence. His wish is granted when on the recommendation of Celtic reserve team trainer, Jimmy Gribben, Celtic buy Jock Stein from Llanelly for £1,200. 1951 – Makes his Celtic debut against St Mirren at Celtic Park on December 8th 1951. 1952 – Stein appointed vice-captain by current captain (that was the captain’s right in those days) Sean Fallon. 1952 – Sean Fallow breaks his arm and the full captaincy was passed to Stein. He would be club captain until his Celtic playing career ended due to injury in 1955/56. 1953 – Captain’s Celtic to Coronation Cup success when Celtic unexpectedly overcome Arsenal 1-0, Manchester United 2-1 and Hibernian 1-0 (in front of 117,000 at Hampden) to become unofficial champions of Britain. 1954 – Skippers Celtic to their first League championship since 1938 and first League and Scottish Cup double since 1914. 1954 – Celtic chairman Bob Kelly takes the players to watch the 1954 World Cup Finals in Switzerland. While the rest of the Celtic party enjoyed the holiday and sympathised with the three Celtic players in the Scotland squad (Evans, Fernie and Mochan) who had been humiliated 7-0 by Uruguay, Jock Stein watched and learned. Firstly, about the shambles of Scotland’s preparations and secondly about the continentals tactics, particularly the Hungarians who were revolutionising the game. 1956 – Stein forced to retire from football after persistent ankle injuries that would result in him having a permanent limp. In total Jock Stein played 148 games for Celtic and scored 2 goals. He was given the job of coaching the reserve and youth players and was responsible for persuading the board to purchase Barrowfield as a training ground. 1958 – Leads the reserves to the second XI Cup with an 8-2 aggregate triumph over Rangers. This was Stein’s first success as a manager. 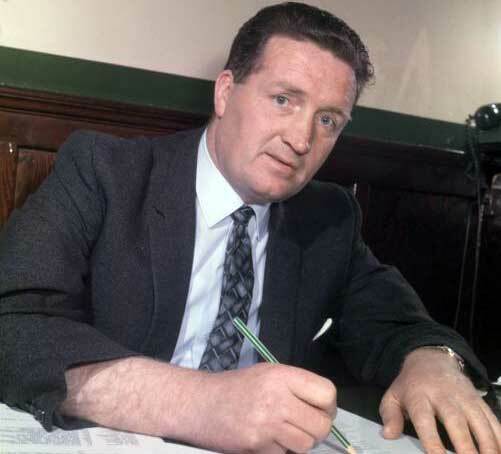 1960 – Accepts the role of Dunfermline manager on March 14th 1960. After only 6 weeks in charge Stein leads the Pars clear of relegation. 1961 – Stein guides Dunfermline to the Scottish Cup for the first time in their history. Ironically this comes via a 2-0 replay victory over Celtic. 1962 – Defeats Everton in the Inter-Cities Fairs Cup (now known as the UEFA Cup) and only loses to Valencia in a third game play-off after retrieving a four goal first leg deficit. 1964 – Becomes manager of Hibs on April 1st 1964. Within months of becoming manager he leads Hibs to Summer Cup success. 1964 – The testimony of his contemporaries is that he was already “miles” ahead of everyone else in his understanding of the game, and in studying how the investment of energy could be tailored to maximum effect. Stein was immersing himself in the structure of the game while the rest simply went out and played. 1965 – On January 12th the four Celtic directors meet in the North British Hotel. The minutes note that “all four have an agreed desire to secure the services of J Stein as manager. Mr Kelly was to approach Stein with the view to offering him the position. (Sean) Fallon was to be offered an increased salary with increased status if Stein was secured. McGrory (current manager) was to continue as public relations officer”. 1965 – On January 14th at the weekly board meeting Kelly states that “he had interviewed Stein and that he was willing to join the club as manager. He had asked however to be allowed to remain for a time with Hibs as they had a chance of winning the league, and that in any case he would require to give reasonable notice. This was agreed to”. 1965 – Due to the leakage of information the board announce a press conference on January 31st. 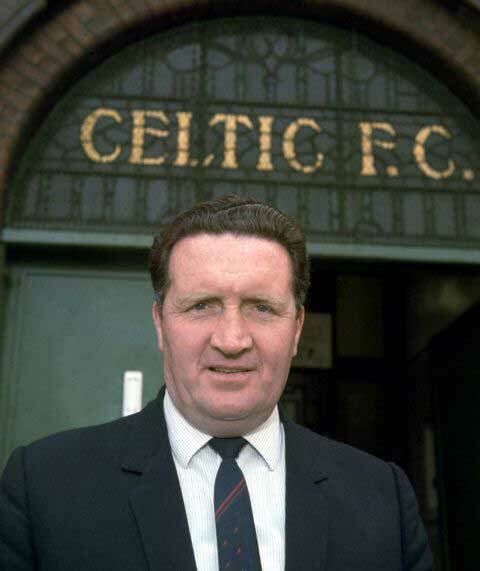 At the press conference it is announced that Jock Stein will assume the role of team manager on March 9th 1965. A few days after Stein takes over his first game in charge is away to Airdrie with Celtic winning 6-0. Stein was also the clubs first non-Catholic manager. 1965 – On April 24th 1965, six weeks after becoming manager, Stein leads Celtic to Scottish Cup success after a 3-2 victory over Dunfermline. This was Celtic’s first silverware in over 7 years. The importance of this victory in the future success of Celtic was not lost upon Stein when he observed many years later, “It wouldn’t have gone as well for Celtic if they hadn’t won this game”. 1965 – A few days after the Scottish Cup success Stein presented to the board two lists of players. The first list, including the name of Joe McBride, was of a list of players Stein wished to buy. The second list contained those players Stein was willing to sell. Names on that list included John Hughes, Charlie Gallagher and Jimmy Johnstone!. Fortunately, the sale of players was restricted to less obvious names otherwise the course of Celtic’s place in European football history may have dramatically changed. Celtic players from that era commented that Stein at that point must have been preoccupied with teamwork rather than giving individuals licence to do as they wish. 1966 – Celtic are crowned Scottish champions for the first time since 1954. They also reach the semi-finals of the Cup-Winners-Cup only to be knocked on away goals by Liverpool in controversial circumstances. 1967 – Stein wins THE LOT. Manages first British team to be crowned Champions of Europe after beating Inter Milan 2-1 in Lisbon. It was also a triumph for attacking flair over an ultra-defensive Italian style that at the time, was threatening to suffocate the game on the Continent. Stein’s style of play changed football and inspired so many football fans that Silvio Berlusconi, owner of AC Milan was later to comment that AC’s great club side of Van Basten, Gullit, Rijkaard and Baresi was based on Celtic after watching Stein’s team pulverise Inter Milan to submission with the finest attacking football he had ever seen. - Manages first EVER team to be crowned Champions of Europe with 11 home-grown players. - Manages the club to two League Championships in a row for the first time in 50 years. - Manages the club to Scottish Cup success..
- Manages the club to League Cups in a row for the first time in Celtic’s history. - Manages the club to the domestic treble for the first time in Celtic’s history. - Manages the club to Glasgow Cup success. - Becomes the First Manager of the First club in history to win ALL competitions entered. 1968 – Wins the League for the third time in a row and the League Cup for the third time in a row. 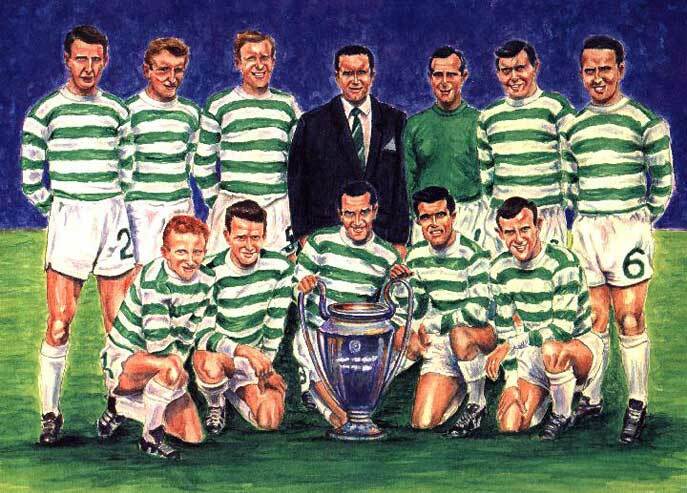 1969 – Wins the domestic treble for the second time in three years. 1970 – European Champions Cup runners-up after losing 2-1 to Feyenoord after extra-time. Defeat heavily fancied English champions Leeds Utd in the semi-final both home and away. Wins both the League and League Cup for the fifth time in a row and finish runners-up in the Scottish Cup. 1970 – Stein starts to rebuild the team by bringing through a batch of home-developed players known as the quality street kids. These players included Davie Hay, George Connolly, Lou Macari, Kenny Dalglish and Danny McGrain. 1971 – Wins both the League for a record equalling sixth time and the Scottish Cup. Finish runners-up in the League Cup. 1972 – Reach the semi-finals of the Champions Cup before losing to old foes Inter Milan on penalties. Wins the Scottish League for a record seventh time in succession and also wins the Scottish Cup to complete the domestic double for the second year in a row. Finish runners-up in the League Cup. 1973 – In January he suffers a suspected heart attack and spends several weeks convalescing. During Stein’s absence Celtic slump in the league. Stein’s return invigorates the team and they go on to win the League championship for the eighth time in a row. Also finish runners-up in both the Scottish and League Cups. 1974 – Stein manages Celtic to the League Championship for a World-record Ninth successive time. Celtic also reach the European Cup semi-final but lose to the hatchet men of Athletico Madrid. Celtic win the Scottish Cup and domestic double for the fifth time in Stein’s tenure and also finish runners-up in the League Cup. 1975 – Win both the Scottish Cup and League Cup. Celtic’s League Cup Final appearance was their tenth successive appearance in the final. 1976 – In July seriously injured in a road accident after returning home from holiday in Menorca. Stein was rushed to hospital in Dumfries. Scarcely able to breathe, a condition which had not deterred a policeman from attempting to breathalyse him as he lay at the roadside. Stein did not return to Celtic Park that season and Celtic failed to win their first silverware since Stein became manager eleven seasons ago. 1977 – Stein returns and Celtic win both the League Championship and Scottish Cup to complete the sixth domestic double during Jock Stein’s twelve years in charge. Celtic also finish runners-up in the League Cup. 1978 – After twelve wonderful years, the greatest manger Scottish football and arguably British football has ever seen resigns from the position of club manager. The board of Kelly’s and Whites offer Stein a position in charge of fund-raising. A shameful act from a shameful group of people when he should have been made club chairman. 1978 – Jock Stein leaves Celtic and takes up the position of manager of Leeds United. 1978 – After 45 days in charge at Elland Road, Stein resigns and accepts the position of Scotland manager. 1982 – Leads Scotland to the World Cup Finals where they go out on goal difference to the Soviet Union. 1985 – On September 10th 1985 at Ninian Park, Cardiff, Jock Stein suffers a fatal heart-attack as Scotland equalise to gain the point needed to make qualification virtually certain to the 1986 World Cup Finals. Scottish League Winners: (Ten times) 1966, 1967, 1968, 1969, 1970, 1971, 1972, 1973, 1974, 1977. Scottish Cup Winners: (Eight times) 1965, 1967, 1968, 1969, 1971, 1972, 1974, 1975, 1977. Scottish League Cup Winners: (Six times) 1965, 1966, 1967, 1968, 1969, 1970.